Air France operates flights from Cape Town and Johannesburg in South Africa to Paris' Charles de Gaulle Airport and beyond to Europe and America. Fly with your French connection - Air France (AF) is the French national carrier and operates flights from Johannesburg and Cape Town (seasonally) to Paris and onwards. Air France is a subsidiary of the Air France-KLM Group, which makes it possible to book KLM flights on Air France's website and vice versa. Tickets can also be combined with both airlines. Air France has been operational since 1933 and is a member of the SkyTeam airline alliance along with Delta Airlines, Kenya Airways, Alitalia and KLM among others. Find out how you can earn a SouthAfrica.TO travel voucher here. 21 April 2015 : Air France has a new 'low season' sale running with sale airfares available on flights from Johannesburg and Cape Town to various destinations in Europe. Flights from Johannesburg to Rome start from R6433*, Venice from R6524*, Barcelona from R6793*, Milan from R6779*, Amsterdam from R7068* and London from R8250*. Flights from Cape Town starts from R6624* to Dublin, R6833* to Rome, R7103* to Barcelona, R7217* to Rome, R7468* to Amsterdam and R8650* to Rome. This sale is for travel from the 16th of July to the 3rd of December and the 24th of December 2015 to the 20th of June 2016. *Price is subject to change, limited availability*. 23 March 2018: From the 1st of April 2018 Air France's Low Cost subsidiary will take over Air France flights between Cape Town to Paris Charles de Gaulle. The low cost carrier will operate three flights per week. Although they usually don't include free meals and checked baggage on their short-haul flights, it seems they do include baggage and meals in their Cape Town flights. Joon flights will depart on Tuesdays, Fridays and Sundays. 5 Jan 2016 : Last year's extensive strikes cost the Air France-KLM group an estimated €500 million, so the airline can certainly not afford another lengthy strike. This time around a minor pilot's union has threated to strike due to possible job cuts and the disciplinary hearing against two pilots involved in last year's strike. The minor union only represents around 10% of the airline's pilots so it is not clear whether this will have any influence on flight schedules, but another large-scale strike could cause problems for the airline. 30 Jul 2015 : This might look like a pun, but we promise it isn't! Chester Missing, SA's favourite puppet, has really gone missing. Comedian Conrad Koch took Chester and Hilary the Ostrich to Canada for a show. On their return both puppets were checked into the hold but didn't make it back to South Africa. Air France is investigating where they were left behind (along with all the other cases of lost luggage on Air France flights). We're sure that Chester and Hilary have enough je ne sais quoi to make their way around France, but ideally we want them returned safely! 16 Jan 2015 : Today the airline confirmed that they have bought 20 000 copies of the latest issue of the French sartical magazine to distribute to Air France passengers at Charles de Gaulle and Orly. This follows the attack on the magazine last week which is believed to be due to the magazine's continued use of the image of Prophet Mohammed. Despite the fact that the use of his image is not allowed in Islam, the magazine decided to once again place his image on the first issue since the attack. Many Muslims who have been sympathetic to the magazine reportedly feel betrayed by the latest issue. Whilst we applaud the government's support of the freedom of press, we fail to see how endorsement of what is clearly an insult to the country's large Muslim community will promote peace. Even less so why Air France, France's flag carrying airline, involved themselves in this sticky situation. March 2014: There are soon going to be another option to fly to Japan. Air France already operates flights to Tokyo's Narita Airport, and from 30 March 2014 will launch flights to Tokyo's Haneda Airport. Being closer to the city centre, Haneda Airport is popular amongst business travellers. This creates 1-stop flight options from Johannesburg to Tokyo Haneda via Paris. 25 Nov 2013. During the northern hemisphere winter Air France launches flights from Paris to Panama City on Mondays, Thursdays & Saturdays in a Boeing 777-200. This creates 1-stop flights from Johannesburg to Panama City via Paris, and and 1-stop flights from Cape Town to Panama City via Paris. 13 May 2013. End of Air France's seasonal Cape Town - Paris flights. 5 Oct 2012. Air France resumes Cape Town - Paris flights. On Tuesdays, Thursdays & Sundays they are scheduled to leave Cape Town at 19h35 & arrive in Paris at 05h55. 3 Nov 2011. Air France announced in May 2011 that from 3 Nov it is "improving" its CPT-Paris flight schedule - Cape Town to Paris flights will leave on Tuesdays, Thursdays and Sundays at 19h35, and land in Paris at 05h55; whilst Paris to Cape Town flights on Mondays, Wednesdays and Saturdays will leave at 23h30 and land in Cape Town at 11h40. Flights will be in a Boeing 777-200 with 250 economy class, 24 premium economy and 35 seats business-class seats. Mar 2010. Air France operates flights from Paris to Johannesburg in an A380 (as well as to Dubai), and reduces the frequency to daily. 18 Feb 2010. Air France operates its first commercial flight to Johannesburg in an A380 (which is also the first commercial flight in South Africa in an A380). 18 Jan 2010. Air France operates its first commercial flight to Dubai in an A380. Dec 2009. Air France reduces its frequency to Johannesburg from 14 to 11 flights. 23 Nov 2009. The first Air France commercial flight in an A380 operates from Paris to New York. 2007. Air France operates the Boeing 777-300 between Johannesburg and Paris. 1953. Air France operates its first flight to South Africa in a Comet. 1946. A Dakar-Baloma-Conakry-Robertsfield-Abidjan-Accra-Lomé-Cotonou-Lagos-Douala-Libreville-Port Gentil-Pointe Noire-Brazzaville route is launched. 1936. Air France operates flights between Toulouse and Dakar. Air France has two scheduled flights a day from Johannesburg to Paris (France), except Wednesdays and Fridays when there is 1 flight. Air France has two scheduled flights a day from Paris to Johannesburg (South Africa), except Tuesdays and Thursdays when there is 1 flight. 10 Dec 2014 : Air France recently partnered with Orange to offer passengers WiFi onboard selected short- and medium-haul flights. This service will only be available on two Airbus A320s. Orange has yet to confirm prices and terms and conditions. In the winter (our summer) of 2013, I (15) made an amazing journey through the northeastern part of South Africa with my sister (16) and my parents. On the 9th of July we boarded our Air France/KLM flight from Amsterdam to Paris. We chose this airline, because my father could get 3 free tickets (Ed: nice!) because he flies a lot with Air France/KLM for work-related trips. After this short and pleasant flight we had to wait a few hours at Paris-Charles de Gaulle, before our plane (the Airbus A380, the biggest aircraft for passengers in the world) was ready to leave on its flight to Johannesburg. During the boarding process, there seemed to be a problem with our tickets. Our seats were changed and the family got split up due to that, with 2 tickets being upgraded to Business Class! This made the 11-hour night flight a lot more comfortable. After a good flight we touched down safely at OR Tambo International in the early morning. We were welcomed by the taxi driver of our first accommodation, MoAfrika Lodge. It was our first time in Africa and we had kind of a culture shock when we drove through Joburg. Later that day we decided to go to Sandton, a western part of the city with big shopping malls, just to settle down a little bit. We took the Gautrain and enjoyed our first day in South Africa. Tired of the flight, we went to bed early. The next day we took a guided tour through Joburg and Soweto. We cycled through Soweto and saw the poverty, next to the big stadiums for the World Cup in 2010. Weird to see all of this. We also visited the Apartheid Museum that day, very interesting. The next morning we got our rented car, delivered at the lodge. After a little bit getting used to the driving on the left-hand side, we headed to Pretoria to see the Voortrekker Monument and Church Square. We continued our way to Hazyview. In Hazyview we stayed in the Sanbonani Resort. We visited the Kruger National Park a few times and drove the Panorama route. We saw loads of animals. This was, for us, the most important reason to go to this country: the wildlife. We spotted 4 of the Big Five, just by driving around at a venture. We also visited the Moholoholo Rehabilation Center, where we touched a cheetah and feeded the vultures. After Hazyview, we went in the direction of Hoedspruit, going to the Timbavati Private Game Reserve. There we stayed in the Umlani Bushcamp. This is something which I would really recommend: it's an amazing place in the bush. We slept in cabins in the middle of the bush and heard the animals around us at night. We went on a few game drives and saw a leopard hanging in a tree, along a lot of other animals. Coming so close to the animals is insane and great! This was absolutely a highlight of our holiday. Our next stay was Mvubu Falls, near Mbabane in Swaziland. We visited the Mlilwane Wildlife Sanctuary, where we cycled between the zebras, antilopes and other soft game. We also visited the Swazi Cultural Village, the dance performance there was incredible. Next up: St. Lucia. Unfortunately, there were no lodges or guesthouses available, so we had to stay in the Elephant Lake Hotel. Wouldn't recommend that hotel if you're staying for more days in St. Lucia. The weather was nice, we even went to the beach, which we didn't expect to do in winter. We saw a lot of hippo's in Lake St. Lucia, as well as crocodiles. We also cycled through the national park and visited Cape Vidal. After St. Lucia, we went to Salt Rock, near to Dolphin Coast and north from Durban. We stayed here in the Saffron House, a lovely place with a great owner. We went to the beach and took some surfing lessons in Durban. We passed the stadium but didn't really visit Durban, because that was discouraged as of the criminality. Safety is one of the things we worried about when we thought about Africa, but we didn't feel unsafe during our whole holiday (except when we encoutered a hippo right in front of our appartment at the resort in Hazyview). From the coast, we drove to the Drakensberg, where we stayed one night at Cathkin Cottage, just to attend a performance of the Drakensberg Boys Choir, which is really nice. We took the Canopy Tour and enjoyed the nature. We stayed two other days in Ardmore, at the guest farm. Also a beautiful place to be. We brought some teddy's and balloons from the Netherlands to give to children. We visited the Isibani Community Center, where we gave our stuff away at the day care. We played with the children and listened to the stories of the volunteers working there. After that wonderful experience, we went to the Spioenkop Nature Reserve for a game drive by horse. We didn't see much animals, but the riding was fun. The next day we travelled to our last accommodation, Glen Reenen Rest Camp, in the middle of the Golden Gate Highlands National Park. The mountains and rocks have the most incredible shapes and colours here. We enjoyed the nature and did a hike. We felt very sorry to go back to Joburg to fly back to Europe. We stayed almost 4 weeks in South Africa and saw a lot, but holidays are always to short. We enjoyed our last glimpse of Africa while driving to the airport. We boarded a night flight from Air France/KLM again. When flying over the equator, we had a lot of turbulence, which was quite annoying, but the flight was good. In Paris our plane to Amsterdam was delayed, but that didn’t matter at all. We would rate the airline with 4 out of 5 stars. We are already missing the country of South Africa and would love to go back once! 29 September 2014. Air France will gradually start resuming their normal flight schedule after the airline’s pilots ended their strike today. The airline will operate normally on all of their routes in the next two to three days. Because most of the aircraft have not been used for several days they have to go through mandatory checks before being allowed to fly again. The airline advises clients to check their flight information before heading to the airport as flights might still be disrupted and cancelled in some cases. 18 September 2014. As a result of the strike that their pilots have embarked on, Air France has cancelled the following flights between Johannesburg and Paris: Flight AF 995 from Joburg to Paris and flight AF 990 from Paris to Joburg on the 18th of September 2014 and flight AF 995 from Joburg to Paris on the 19th of September 2014. Passengers whose flights have been cancelled will be given a full refund. 2014. 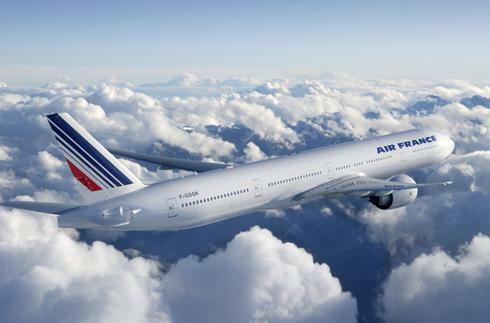 Air France plans to revamp its business and first class cabins on its Boeing 777 planes. 15 September 2013. Air France takes delivery of its 9th Airbus A380. 4 September 2013. Air France yesterday deployed an A380 on 3 of its 14 flights a week from Paris to Shanghai - it's a bit of an about-trip, but you can fly Johannesburg to Shanghai flights via Paris. Note when booking the flights to Shanghai that Air France has a codeshare agreement with China Eastern Airlines, so some of the flights booked on its site are operated by them. 1 Jun 2009. Air France flight 447 goes missing in the Atlantic.